Still liking this slice of silliness, but a bit disappointed with how some of the characters are written. I know that Hayato is supposed to have something in his past, but right now he seems a moody, angsty musician without a cause. We open with our drunk vampiresses happily baring their fangs at the shocked Ken-chan. 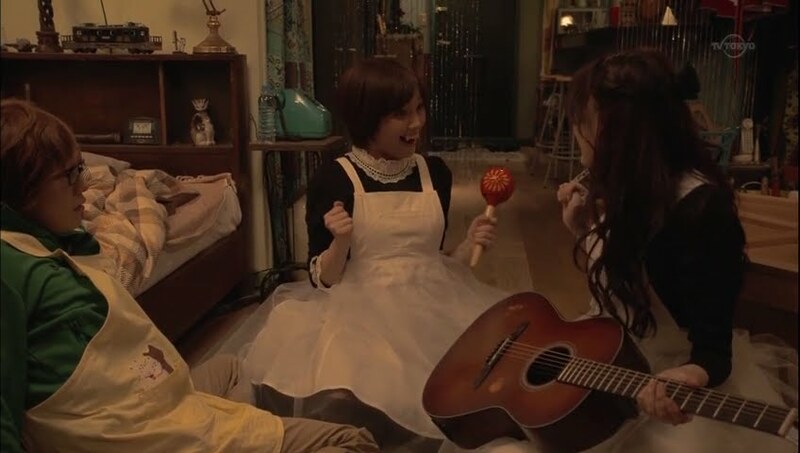 When Koma goes to drink his blood, Ken protests and says he is not delicious and Sakurako rushes over and starts playing the guitar. She then throws maracas at Koma and they make a new rule that playing musical instruments lessens their desire for blood. They happily play and they really do feel their bloodlust subsiding. As the two sleep their drunkenness off in the coffin Koma made, the frightened Ken bolts from the apartment and goes into the club in search of garlic. Aoi finds him and asks what he is doing and he starts groveling for mercy. This surprises Aoi—was he stealing? Seeing it is just his boss, Ken gets up and assures her he isn’t. He goes to tell Aoi about the girls being vampires, but stops himself. He then hands over the garlic to Aoi and tells her to carry it at all times. 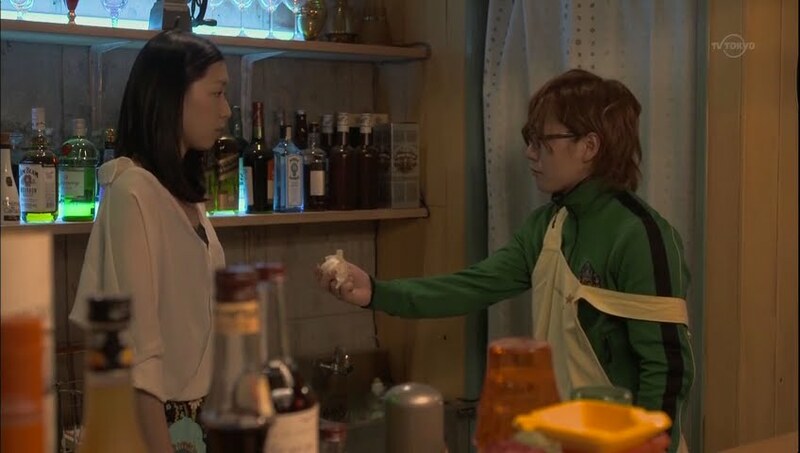 Aoi refuses since she doesn’t want to be known as the smelly woman, but he presses it into her hands and tells her to trust him before bolting. This makes Aoi laugh. He’s a really indecisive person, isn’t he? Back in the apartment, Ken had put the cover on the coffin and piled a bunch of stuff on top, but Koma manages to open it. She and Sakurako then sit up hungover. Sakurako reveals she drank beer when Hayato carried Koma up the apartment and Koma calls her an idiot. Does her friend really think love between a human and vampire will work out? Isn’t Sakurako already having a hard time controlling her hunger around him? Koma says she will only be overcome and then come crying to Koma later saying she has killed Hayato. Sakurako angrily says she will never do that to the person she loves. Silence. The doorbell rings and it’s Hayato! Speak of the devil. He’s happy to see that Sakurako seems more like her normal self. The abashed girl apologizes for the other night. Hayato then asks her out. This shocks her even more, but she happily accepts. Hayato goes downstairs to wait and Sakurako’s happiness fades at Koma’s expression. She tells her friend she is going out and Koma only responds with she can do whatever she wants. Sakurako angrily replies that she will. Sakurako changes her clothes and shoots a look at Koma who says nothing. On her way out, Sakurako runs into Ken who is carrying a board home. She asks what happened to him as he didn’t come home. Ken is surprised. This means she doesn’t remember, doesn’t it? Sakurako then continues downstairs and turns to ask Ken if she looks okay in her outfit. Ken assures her she looks fine and asks where she’s going. He’s a bit worried to hear she’s going out with Hayato. Sakurako makes it downstairs and pulls out her parasol. Hayato asks what is wrong and she tells him she’s not good with the sun. His eyes then strays to the maraca peaking out of her purse. Sakurako tells him that it is her good luck charm. Her smile fades…it’s strange, isn’t it? Hayato comes close and then takes the parasol from her—he’s no good with heat either. Enter Risa and her cronies. The human girl tells Sakurako that she is better off staying indoors if she can’t take the heat and hands the parasol back to Sakurako. 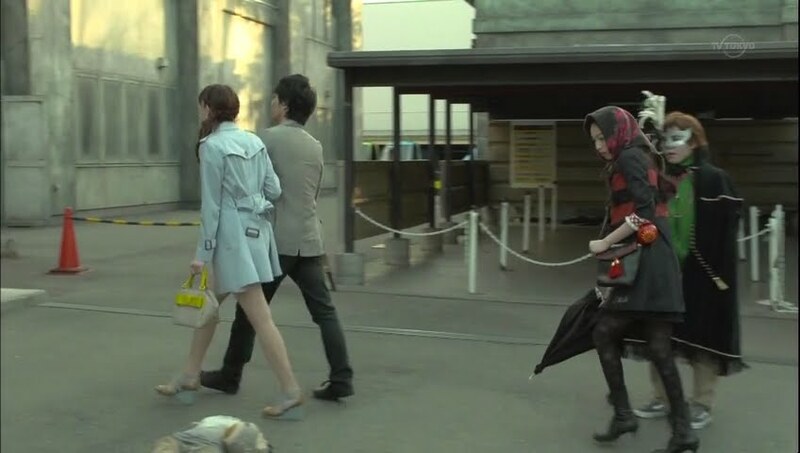 Risa then reminds Hayato about taking her to the amusement park. Her friends leave and Risa goes to pull Hayato away. He shakes her off and says he’s with Sakurako. Then she can come, too. Won’t it be more fun with more people? When it looks like Hayato will resist, Risa says papa really liked his song and wants her to push Hayato more. Such a desperate and see through attempt. They go on ahead and Sakurako stands silent watching them for awhile. She then rushes after them and says she will tag along. 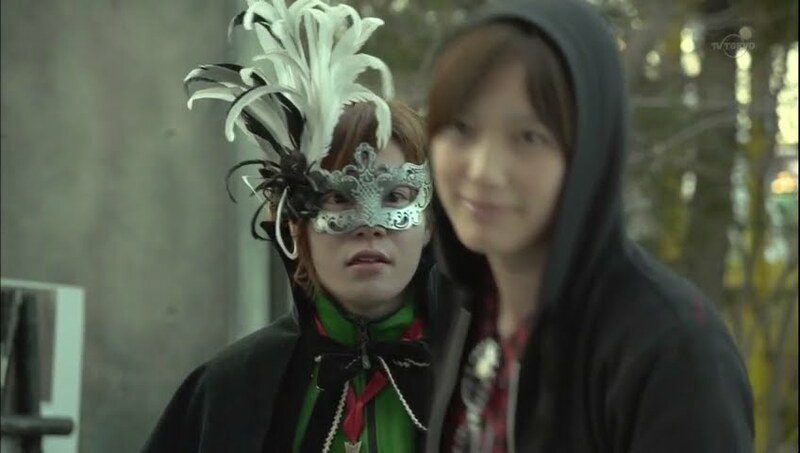 This makes Hayato smile, but definitely upsets Risa. Guess she was hoping Sakurako would take the hint and leave her alone with Hayato. As the trio set off, Koma comes up and watches them. She then notices Ken watching them from above. She smiles and goes to join him on the bridge. She complains that Hayato really makes her angry. Doesn’t Ken think the same thing? He nods and Koma asks for his help. She wants him to bring Hayato to a dark place. Why? What will she do? Koma smiles and tells him it’s a secret. She then takes off calling at him to come with her. Ken is not happy with this at all. At the amusement park, Risa monopolizes Hayato so Sakurako must ride the rides alone. Koma and Ken watch on and Koma tells Ken that she found the perfect dark place—the haunted house. Ken in a poor disguise leads the trio to the house. 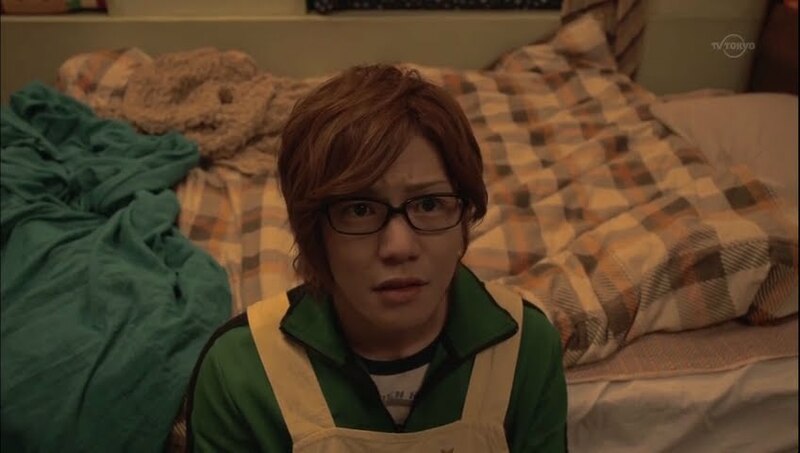 He’s worried, especially when Koma tells him he did a good job. This is bad. For being a vampire, Sakurako is easily frightened. The house scares her and she grabs on to Hayato in fear. She then gets embarrassed and lets go, but he takes her hand in his. He then takes her and goes back the way they came in leaving Risa all alone. We then see Risa exit alone followed by Koma and Ken, but no Sakurako or Hayato. Koma is upset. She is the only one that Sakurako needs by her side. She stalks off leaving Ken alone. He does take off and follow the girl, though. Hayato and Sakurako head to the ferris wheel while Koma and Ken watch. Ken is really worried about Sakurako being in an enclosed, small space with Hayato, but Koma assures him that Sakurako won’t be able to do anything. Meanwhile, the Count’s goons watch on. 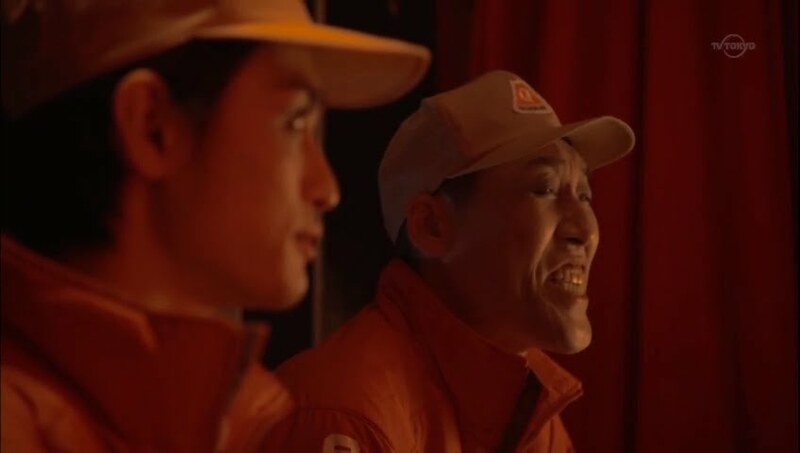 Inside the ride, Hayato says that it’s been awhile since he’s ran that much. He experiences different things with Sakurako. She apologize and he says it might be a good thing. this surprises her. 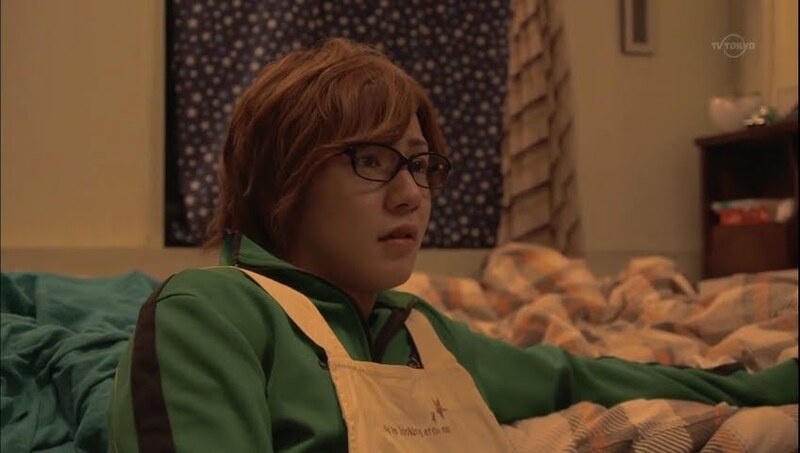 Hayato then says it’s the first time he has had such fun with a woman and the first time he’s been so irritated. Irritated? Why? Because of Kentarou! Sakurako lives with him, doesn’t she? Sakurako just apologizes and this makes him laugh. She’s apologizing just for that? Sakurako laughs and says that isn’t it. Hayato then asks her to take her scarf off since the sun won’t reach her inside. Sakurako does so and Hayato tells her they will have to go out at night next time so he will be able to see her face. Sakurako then changes the subject. Can you see the café from there? Hayato says it is impossible and Sakurako chides him as you won’t know until you try. She tries to find it outside the window when Hayato calls her strange. That’s bad isn’t it? No, not necessarily. Hayato then leans in to kiss her, but Sakurako puts her head on his lap as her fangs have come out. It’s no good after all. She doesn’t like it? It’s not that. As soon as the ride stops, she rushes out and Hayato tries to follow her, but Ken gets in his way and warns Hayato that it’s best not to get close to Sakurako. The Count hears his minions report and laughs evilly. Things are getting interesting. Meanwhile, Hayato demands to know why he can’t get close to Sakurako. Ken goes to tell him and we cut to the emotionless Koma. 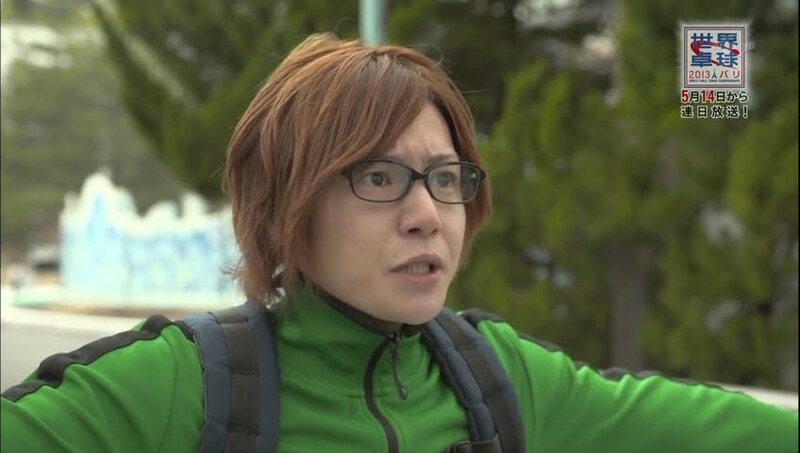 Honda Tsubasa is really good at that type of acting. Sakurako runs and cries. A vampire’s hunger is dependent on the size of their emotions. If she really likes Hayato, then that means she hungers for his blood greatly. It is impossible for vampires to be with humans they love for an eternity. Well…duh. Next episode promises a funny showdown between the vampires and their human friends against the count. I do find it funny that Ken seems to have just decided to go with it. He hasn’t told anyone that they’re vampires (presumably because he thinks they won’t believe him) but he’s still living with them so he can’t find them that scary. I wonder how Aoi knows what they are. I mean, if she was a vampire as well, they would’ve seen it in her, right? This is one of those shows that is actually pretty bad but for some reason I keep watching anyway. Admittedly, i only started watching it because i find Aya Omasa utterly adorable, lol. Next weeks preview looked good though, i like the idea of their friends teaming up with them to beat the baddies. Ken is cute the way he cowered away from them and all, but still, he does go along with Koma. I think it’s easy to see the girls aren’t evil vampires. I’m kind of wondering about Aoi because I thought she could be one or at least know about them, but it’s kind of hard to tell. LOVE Oomasa Aya as well. This show is campy and cheesy and has some lackluster moments, but she and Honda Tsubasa more than make up for it. They keep me watching from week to week and I’m looking forward to the upcoming episode where Ken and human friends stand by and fight with the girls. now that you mention it, hayato is like a musician without a cause. I kind of want them to explain the story behind the guitar. i still think this story is cute. I know!!!! When will we learn Hayato’s story. Is he just a cold callous man who used women until he met Sakurako? Why did he ditch the guitar? What’s his problem? Dying to know. Looking forward to the next episode.